Prepare the batter as directed. Pour the batter into the cones, filling them about half-way. Bake as directed for cupcakes and allow to cool completely. Pro tip: Bake in muffin tins or cut holes in an aluminum pan and turn it upside down on a sheet pan to hold the cones in place. Pipe generous swirls of buttercream frosting on top to look like soft serve ice cream. 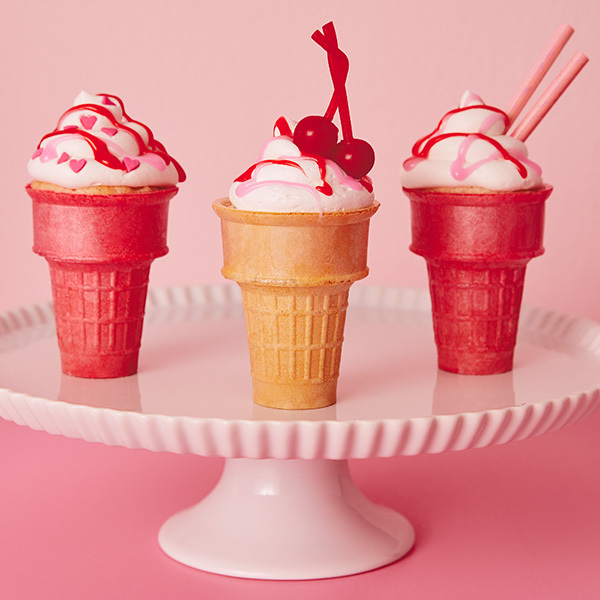 Decorate each as you would an ice-cream sundae—with sprinkles, drizzles of decorating gel, “cherries,” and straws—or make a “Cupcake Sundae Bar” and let kids top their own.